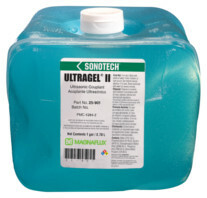 Ultragel II has been recognized as the industry´s most specified and used ultrasonic couplant for more than 35 years. Ultragel II possesses outstanding acoustic performance, chemical characteristics and corrosion inhibition and is ideal for flaw detection, thickness gauging, flow metering and acoustic emission testing across a broad temperature boundary (-10° to 210° F). Ferrous corrosion inhibition rating of 90. P/N 25-901 - 1 Gal. P/N 25-955 - 55 Gal. Echogel is a Glycerine and Silicone-free couplant formulated for use in inspections where salt cake or metal corrosion salts are present. 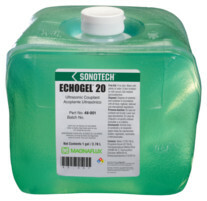 Echogel resists viscosity breakdown on salt-caked boiler surfaces and other corroded materials and contains a ferrous corrosion inhibitor with a relative effectiveness rating of 65. Operating temperature range: 27° to 140° F.
Specification Compliance: ASTM F519. NAVSHIPS MIL STD 767 AND 2041. P/N 47-901 - 1 Gal. P/N 47-955 - 55 Gal. P/N 48-901 - 1 Gal. P/N 48-955 - 55 Gal. 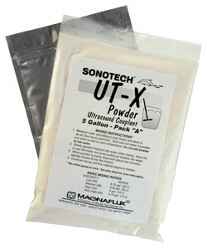 UT-X Powder is an environmentally benign couplant concentrate useful for flaw detection and thickness gauging applications where ferrous corrosion inhibition is required. UT-X® Powder performs well and retains viscosity on salt caked boiler tubes, corroded pipe, structural steel, steel billets, welds and ship plate. It possesses an operating temperature range of 32° to 120° F.
Soundsafe is an environmentally benign high-performance couplant formulated for use in overhead vertical and horizontal applications where concern for the environment is a primary consideration. 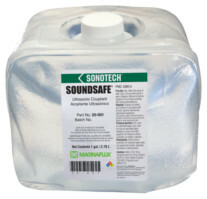 Soundsafe possesses high humectant levels to slow drying, increase acoustic impedance and provide transducer lubrication. It contains ferrous corrosion inhibitors with a relative effectiveness rating of 75. Soundsafe has an operating temperature range of 0° - 200° F. It is compatible with most composites and metals, except magnesium and magnesium alloys which should be pretreated before use. Specification Compliance: ASTM F945. 5968, 5980 . PRATT & WHITNEY PWA 286, 275, 1484, 36604, 36700, MCL E-205 Type II (ASTM F945), AMS 5544, 5536, 6359, 4037, 5608 (Haynes 188), 5508, 4375. P/N 20-901 - 1 Gal. P/N 20-955 - 55 Gal. 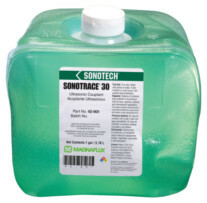 Sonotrace is a Glycerine and Silicone-free, water-based couplant formulated for flaw detection and thickness gauging. Sonotrace is the perfect couplant for use with applications where Halogens, Sulfur and low melting point metals must be kept to a minimum. It comes in two viscosities from medium viscosity to a very high viscosity gel and has an operational temperature range of 25° - 175° F. Ferrous corrosion inhibition rating of 80. P/N 42-901 -	1 Gal. P/N 42-905 - 5 Gal. P/N 42-955	- 55 Gal. P/N 43-901 -	1 Gal. P/N 43-905 - 5 Gal. P/N 43-955	- 55 Gal. 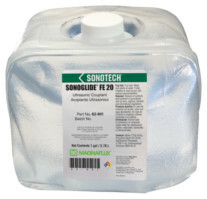 Sonoglide FE is an environmentally benign, Silicone-free couplant specially formulated for ferrous metals where short-term corrosion is a concern. It contains a ferrous corrosion inhibitor with a relative effectiveness rating of 75, is slow drying and will remain stable on corroded or salt covered surfaces. Operating temperature range: -60° to 250° F.
P/N 82-901 -	1 Gal. P/N 82-955	- 55 Gal. Soundclear is an excellent price to performance ratio environmentally benign couplant for flaw detection and thickness gauging. Soundclear contains humectants to slow drying and increase acoustic impedance and has an operating temperature range of 20° to 200° F. Soundclear contains a corrosion inhibitor for steel with a relative effectiveness rating of 45 and is compatible with aluminum, titanium and plastics. It is not recommended for use with magnesium. P/N 31-901 -	1 Gal. P/N 31-955	- 55 Gal. If you do not see what you need, please give us a call at 713-861-3270 or email us at sales@stroudsystems.com and we will be glad to answer any questions you may have. Thank you for visiting our website. We look forward to assisting you with your needs.